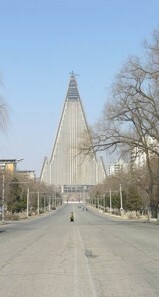 The construction of the 330 m tall tower in Pyongyang, North Korea began in 1987. It has a total 360,000 m² (3.9 million ft²) floor space and 105 stories. The building should have been opened in 1989, by that time it could have been the tallest hotel in the world and the 7th largest skyscraper. 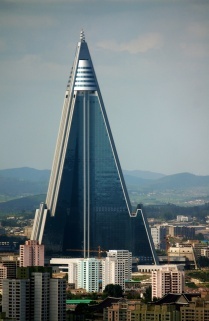 North Korea have spent ~$750 million or 2% of the country's GDP on the Ryugyong Hotel. The hotel was designed to have 3,000 rooms, 7 revolving restaurants, casinos(! ), nightclubs(!) and Japanese lounges. In 1989 -the original completion date- they had several construction method and material problems therefore the opening was delayed, but in 1992 the construction came to a complete halt due to funding problems, electricity shortages, and the prevailing famine. 2011 Update: in July 2011 the exterior work on the facade have been finished. Final completion will be in 2012 when the hotel starts to operate. 2008 Update: After 16 years Ryugyong Hotel is starting to get back to life. Egypt's Orascom group has recently begun refurbishing the top floors of the tower. The company has put glass panels into the concrete shell and installed telecommunications antennas. South Korean estimations say that it would cost $2 billion to finish the hotel and make it safe, that is the same as 10% annual GDP of North Korea. In April 2008 Orascom group has started refurbishing the Ryugyong Tower, starting with the top floors. In late 2008 the work on cladding has been the main focus of construction. Works on the tower will be finished by 2012, the year of the 100th anniversary of the birth of Kim Il Sung, ex leader of North Korea. Orascom claimed that the main goal would mean to make the tower more attractive. Hopefully it does not mean finishing the cladding, yet the structure would be left unhabitable. The Dubai based Emaar Properties developer company showed their interest in the construction of Ryugyong Hotel Tower. Emaar is one of the largest developer firms in the world and they are known for building the world's tallest tower, the Burj Dubai. In 2006 the hotel was still not finished (it had reached its full structural height though) and left alone with a crane on the top. The building is completely empty, there is no facade on the tower either. 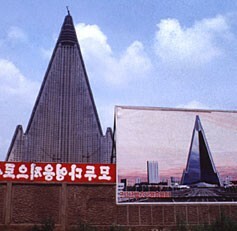 The Ryugyong Hotel with the current structure will never be opened. The Government of North Korea was trying to find new investors to build a new structure, they would need ~$300 million for this. The tower is still by far the tallest in Pyongyang (the capital city) and in the whole of North Korea.